Along with a delegation of Central Florida’s elected officials and community leaders, Orange County Mayor Teresa Jacobs recently traveled to Phoenix, Arizona, for an Orlando Economic Development Commission (EDC) mission trip focused on that city’s best practices and innovative approaches to regionalism, with the goal of helping further economic development to occur here. The 2015 Leadership Experience focused on best practices used in Phoenix and innovative approaches to regionalism that may help further economic development in Central Florida. The three-day trip with 80 delegates centered on the theme of next-generation innovation and the new regionalism. The delegation learned how technology giant Intel has developed the area of advanced manufacturing in Arizona and details of Greater Phoenix’s regional strategic plan. Arizona State University (ASU) President Michael Crow also shared his insight into ASU’s campus expansion in downtown Phoenix. 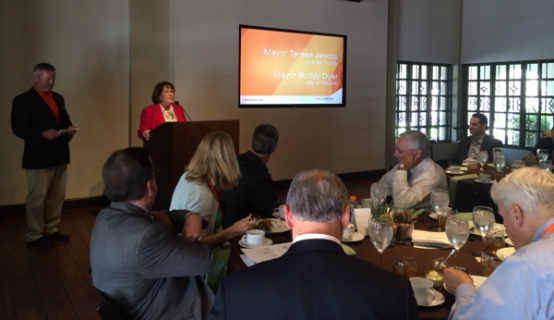 Mayor Jacobs joined the EDC’s trip to Austin, Texas, in 2012, which paved the way to a major initiative for the region. The region’s branding campaign, “Orlando. You don’t know the half of it.” grew out of learning how Austin’s leadership developed an effective brand that transformed their economy. Mayor Jacobs then hosted Orange County’s Branding Summit in October 2012 and announced that the EDC would lead the new initiative through a regional branding committee consisting of local business leaders familiar with the region’s economy. Launched to the public in 2014, the branding initiative is a key priority for Mayor Jacobs and area economic development leaders. The initiative is designed to boost awareness of Central Florida’s businesses and innovation assets among targeted industry leaders and site selectors to encourage economic development and job creation. Mayor Jacobs is a board member of the EDC, which serves a four-county area and the City of Orlando to attract, retain and grow jobs for the region.